© 2017 Rathi and Mazek. The integrity of the acetabular labrum is crucial to normal biomechanics of the hip joint. Disruption of the labral seal could be detrimental to the overall nutrition of the cartilage, leading to its premature degeneration. The aim of this study is to determine the clinical effectiveness of arthroscopic hip labral reconstruction using fascia lata allograft. The hypothesis is that labral reconstruction would provide good clinical outcomes. We retrospectively reviewed all 10 patients who underwent labral reconstruction with fascia lata allograft from January 2013 to October 2015. We assessed improvement in pain and function, complications, and subsequent surgery. The minimum follow-up was 12 months (average, 22.9 months; range, 16–36 months). All patients reported subjective improvement in preoperative pain and function. The mean modified Harris hip score improved significantly from 58 (55-60) to 95 (91-98). The mean change of modified Harris hip score was 36 (31-41) and mean post-operative patient satisfaction score was 9.5(8-10). We observed no radiological progression of arthritis as well as no patient had revision procedure including total hip replacement. Arthroscopic labral reconstruction using a fascia lata tendon allograft is an effective and safe procedure that not only provides excellent clinical outcomes in short term but also potentially prevent continued cartilage degeneration by restoring acetabular labral seal in patients with deficient or resected labrums. Keywords: Arthroscopic labral reconstruction, Labral tear, Hip arthroscopic surgery, Fascia lata, Allograft, Femoroacetabular impingement. The integrity of the acetabular labrum is crucial to normal biomechanics of the hip joint . There has been increased interest in the function of the acetabular labrum and its clinical relevance in recent times. The acetabular labrum is a fibrocartilaginous structure that runs around the circumference of the acetabulum, forming a labral suction seal. Current evidence suggests that the hip fluid seal is important for intra-articular fluid pressurization and fluid film lubrication . Consequently, disruption of the labral seal could be detrimental to the overall nutrition of the cartilage, leading to its premature degeneration . The acetabular labrum enhances hip stability by effectively increasing the area of articulation between the acetabulum and the femoral head. A three-dimensional motion analysis system and cadaveric specimens with intact, vented, and torn acetabular labra, showed that 43% to 60% less force was required to distract the femur a standardized distance after venting or tearing of the labrum . From the biomechanical data available, it would seem reasonable to conclude that an intact labrum provides a biomechanical advantage to the hip and every effort should be made to preserve the labrum. The literature reviews on the results of Femoroacetabular impingement (FAI)surgery have shown the importance of labral preservation and noted that if the labrum is reattached as opposed to resected, patients have improved pain and function as determined by postoperative hip function scores [5-7]. It would seem logical to consider based on these studies that reconstruction of the labrum in the situations where the labrum was missing or beyond salvage, may improve the mechanics of the hip and lead to better pain relief and function. The purpose of this study is to determine the clinical effectiveness of arthroscopic hip labral reconstruction using fascia lata allograft. Inclusion criteria were adult patients having undergone arthroscopic labral reconstruction with tensor fascia lata allograft (The Human Tissue Bank, Katowice,Poland) during the study period for symptomatic labral tear without advanced radiographic osteoarthritis with minimum follow-up of one year and agreed to participate in the study. For this study, we excluded 8 patients who underwent labral reconstruction with indirect head of rectus femoris tendon autograft and are part of another report. One patient in labral reconstruction with tensor fascia lata allograft group has less than one-year follow-up is also excluded from the study. Clinical and radiographic examinations were done preoperatively, at 6 weeks and 1 year postoperatively. At initial evaluation, the patient underwent physical examination that included bony and soft tissue palpation, range of motion testing, and special diagnostic tests. The special tests included the impingement test and flexion, abduction, and external rotation (FABER) test. The entire patient cohort detailed subjective questionnaire modified Harris Hip Score (mHHS) at each clinical visit (preoperative, six weeks postoperative and one year postoperative) and Patient satisfaction outcome score post-operatively once only. Patients also underwent radiographic evaluation that included anteroposterior (AP) pelvis view for the examination of joint space and center edge angle, cross-table lateral view to measure alpha angle, and false profile view to determine over coverage. Acetabular over coverage was also determined by a crossover sign or posterior wall sign on AP view. Radiological progression of osteoarthritis was recorded according to Tönnis scale . A magnetic resonance imaging (MRI) was completed in all patients for chondral and labral assessment. In addition, the subjective improvement in pain, complications, revision surgeries, or conversion arthroplasties after labral reconstruction were also recorded. Surgical technique for Arthroscopic labral reconstruction with fascia lata allograft was described in literature . Surgery was performed with the patient in the supine position on a traction table. 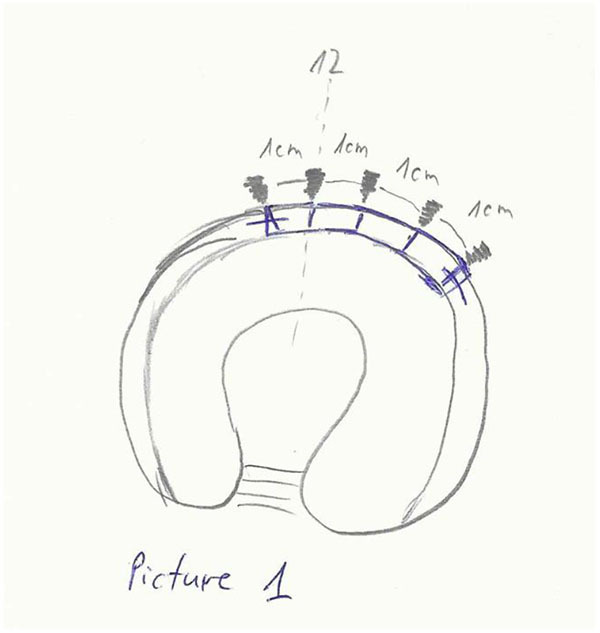 The anterolateral portal (AP) was used for viewing using a 70° arthroscope and the mid anterior portal (MAP) was used as a working portal. Diagnostic arthroscopic surgery was performed initially for the whole joint. Once the decision for labral reconstruction was undertaken, nonfunctional part of the labrum is removed until healthy labrum edges were achieved and the size of the defect was measured. Acetabuloplasty was then performed to prepare the bed for labral reconstruction. The graft was then prepared using fascia lata allograft with Krackow stitches to a length of approximately 2 mm longer than the measured defect length on either side. A third portal, the distal accessory anterior portal (DAAP) was created to drill the anchor sites at 10 mm (Fig. 1) intervals. One of the end sutures on the end of the graft was used to lead the graft into the joint through the MAP and anchors (knotless, polyetheretherketone (PEEK) Parcus Medical™) were used to secure the graft to the acetabular rim (Fig. 2). Gaps between the native labrum and graft were avoided. Traction was released, and a bird’s-eye view was taken of the reconstructed labrum, demonstrating a visually appropriate initial fluid seal effect. Fig. (2). Final picture after labral reconstruction. Postoperatively, patients are allowed partial weight bearing on the operated extremity and 2 crutches from the first day after surgery till two weeks. Hip flexion is limited to 90 degrees and internal rotation to 20 degrees for first six weeks. Continuous passive motion machine is used for 4 weeks for 6 to 8 hours per day. Physical therapy is used to first restore passive motion, followed by active motion and, lastly, strength. There were 10 patients (all men) with a mean age of 35 years (range, 26–44 years) and with mean follow-up of 23 months (range,16–36 months). Demographics details are shown in Table 1. No intraoperative or postoperative complications were observed in any of the hips. We have not observed progression of osteoarthritis on plain radiographs on latest follow-up. None of the patients had undergone or scheduled for revision surgery or arthroplasty. All the procedures were primary hip arthroscopies. Femoroplasty as well as resection of the acetabular rim was carried out in all hips with reconstruction of the labrum. A detailed overview of the intraoperative findings is given in (Table 1). All ten patients had some degree of acetabular cartilage changes while femoral head cartilage was normal. Acetabular cartilage changes were classified according to the geographic zone method described by Ilizaliturri et al. . Seven patients had grade II (Outerbridge classification) changes; two of them required micro fractures while five patients had debridement of the lesion. Two patients had grade III changes, one of them had microfracture of the lesion while in other case cartilage repaired with collagen gel. All 10 patients reported improvement of their symptoms. Post-operative details are shown in (Table 2). The mean mHHS was significantly better from 58 (55-60), preoperatively to 95 (91-98) at mean latest follow-up. The mean change of mHHS was 36 (31-41). All the patients are very satisfied with the outcome of the surgery with mean post-operative patient satisfaction score is 9.5(8-10). One patient form the present case series had revision hip arthroscopy to address the cartilage lesion. The intra-operative picture (Fig. 3) confirms the integration of the graft. Fig. (3). 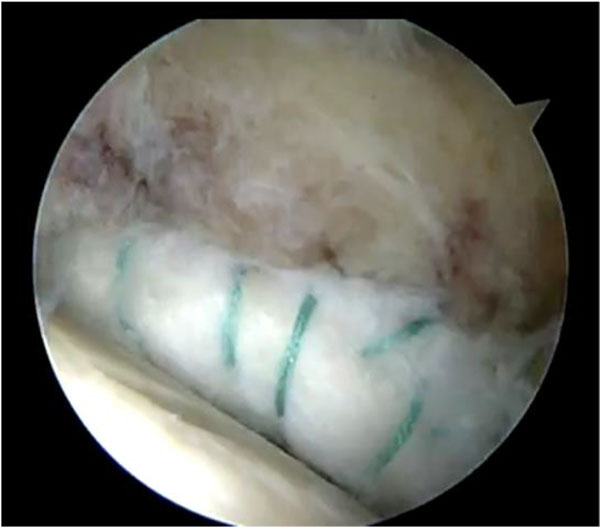 Integration of graft observed at revision surgery to address cartilage lesion. This study sought to investigate patients undergoing labral reconstruction to determine the subjective improvement in pain they experienced, the complications and reoperation rates including conversion to Total hip replacement (THR). The present study shows that the described technique for labral reconstruction is safe, reproducible and leads to excellent subjective patient outcomes. 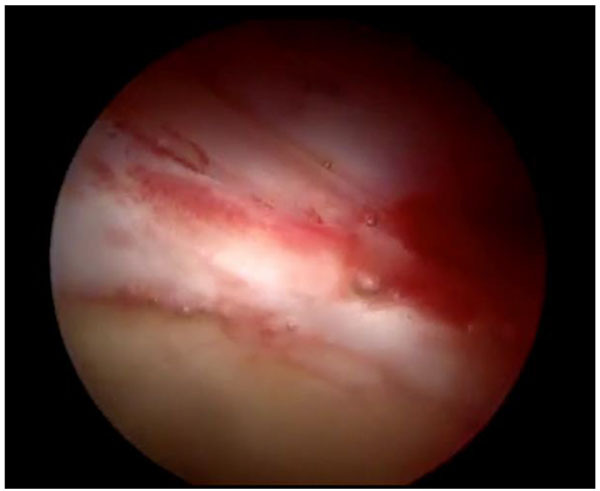 “The importance of the acetabular labrum has been well documented for the health and function of the hip joint.”  Labral tears are a significant cause of hip pain and are currently the most common indication for hip arthroscopy. Labral lesions have been studied extensively. Although there are some studies that suggest removal of the acetabular labrum does not significantly increase the pressure or load in the acetabulum and does not predispose the hip to premature osteoarthritis, there are plenty of studies that do not support these arguments . Table 1. Patient Demographics & Intra-operative findings. The current gold standard of treatment of labral tears is labral preservation, primarily in the form of labral repair . However, in the cases where labral tears are non-repairable, labral reconstruction should be considered. The rationale is that reconstruction of the absent or insufficient labrum has the potential of restoring hip stability while recreating labral sealing properties and leads to superior clinical results . Philippon et al. reported improvement of mean mHHS from 62 (range, 35 to 92) preoperatively to 85 (range, 53 to 100) postoperatively and median patient satisfaction was 8 out of 10 (range, 1 to 10) in a series of 95 patients who underwent labral reconstruction with Iliotibial band (ITB) autograft at a mean follow-up of 18 months . Moya et al. reported a mean improvement of 39 points in Non arthritic hip score (NAHS), from 47(SD17.6, CI95%) to 86(SD10.5, CI95%) with 85%cases had satisfactory results in a series of 20 patients with labral reconstruction at a mean follow-up of 5.1 years . The described study confirms excellent patient satisfaction and a mHHS improvement from 58 preoperatively to 93 postoperatively. These results are in agreement with the literature for joint preserving hip surgery and support the argument for labral reconstruction [1, 13, 14]. In the presented case series, we have observed no radiological progression of arthritis as well as no patient had revision procedure including total hip replacement. These findings reinforce the argument that the labral resection results in higher articular surface stresses that predispose to premature hip osteoarthritis . Sierra et al. first described the open technique while Philippon et al. described the arthroscopic labral reconstruction. Labral reconstruction can be undertaken with either autograft or allograft. Described allografts used to labral reconstruction in the literature include; semitendinosus allograft, iliotibial band allograft, hamstring allograft and allogenic labral transplantation [17-19]. We prefer the fascia lata because it is easy to adjust the diameter of the graft and we use tabularized as they swell compare to other graft options . A recently published biomechanical study of different graft choices including acetabular labrum, iliotibial band, semitendinosus, gracilis, indirect head of the rectus femoris, and anterior tibialis tendons displayed similar cyclic elongation behavior in response to simulated physiologic forces . The use of allografts may restore the anatomy and labral function with no donor-site morbidity, decreased operating time, predictable graft size and quality, easier and less painful rehabilitation. The cost related to the use of allografts is higher than that of autografts, and there are still concerns about transmission of infectious diseases associated to allografts. Although with current screening, processing and sterilization techniques the risk of disease transmission with allografts is extremely low, it should not be overlooked and was taken into consideration . This study has some limitations. First, it is a retrospective study with limited patient population and short follow up due to relatively recent development of the surgical technique used. Second, although our patient-reported outcome scores seem similar to those described in the literature they are not compared with control group. Third, the improvement of pain and function cannot be attributed only to the labral reconstruction; it is also related to bony corrections as well as management of cartilage lesions. Despite these limitations, early reporting of short-term data for new procedures is prudent to publicly evaluate and discuss the role of such procedures in clinical practice and to refine their technique to maximize the benefits conferred to the patient. We encourage further higher level studies to evaluate long-term subjective and objective patient outcomes after labral reconstruction. No external funding received for the study. Philippon MJ, Briggs KK, Hay CJ, Kuppersmith DA, Dewing CB, Huang MJ. Arthroscopic labral reconstruction in the hip using iliotibial band autograft: technique and early outcomes. Arthroscopy 2010; 26(6): 750-6. Ferguson SJ, Bryant JT, Ganz R, Ito K. An in vitro investigation of the acetabular labral seal in hip joint mechanics. J Biomech 2003; 36(2): 171-8. McCarthy JC, Noble PC, Schuck MR, Wright J, Lee J. The Otto E. Aufranc Award: The role of labral lesions to development of early degenerative hip disease. Clin Orthop Relat Res 2001; (393): 25-37. Crawford MJ, Dy CJ, Alexander JW, et al. The 2007 Frank Stinchfield Award. The biomechanics of the hip labrum and the stability of the hip. Clin Orthop Relat Res 2007; 465(465): 16-22. Espinosa N, Beck M, Rothenfluh DA, Ganz R, Leunig M. Treatment of femoro-acetabular impingement: preliminary results of labral refixation. Surgical technique. J Bone Joint Surg Am 2007; 89(Suppl. 2 Pt.1): 36-53. Fujii M, Nakashima Y, Noguchi Y, et al. Effect of intra-articular lesions on the outcome of periacetabular osteotomy in patients with symptomatic hip dysplasia. J Bone Joint Surg Br 2011; 93(11): 1449-56. Larson CM, Giveans MR. Arthroscopic debridement versus refixation of the acetabular labrum associated with femoroacetabular impingement. Arthroscopy 2009; 25(4): 369-76. Tönnis D. Normal values of the hip joint for the evaluation of X-rays in children and adults. Clin Orthop Relat Res 1976; (119): 39-47. Matsuda DK, Burchette RJ. Arthroscopic hip labral reconstruction with a gracilis autograft versus labral refixation: 2-year minimum outcomes. Am J Sports Med 2013; 41(5): 980-7. Ilizaliturri VM Jr, Byrd JW, Sampson TG, et al. A geographic zone method to describe intra-articular pathology in hip arthroscopy: cadaveric study and preliminary report. Arthroscopy 2008; 24(5): 534-9. Sharfman ZT, Amar E, Sampson T, Rath E. Arthroscopic labrum reconstruction in the hip using the indirect head of rectus femoris as a local graft: Surgical Technique. Arthrosc Tech 2016; 5(2): e361-4. Philippon MJ, Nepple JJ, Campbell KJ, et al. The hip fluid seal--Part I: The effect of an acetabular labral tear, repair, resection, and reconstruction on hip fluid pressurization. Knee Surg Sports Traumatol Arthrosc 2014; 22(4): 722-9. Moya E, Ribas M, Natera L, Cardenas C, Bellotti V, Astarita E. Reconstruction of nonrepairable acetabular labral tears with allografts: Mid-term results. Hip Int 2016; 26(Suppl. 1): 43-7. Beck M, Fucentese SF, Staub L, Siebenrock K. [Surgical dislocation of the hip for the treatment of femoroacetabular impingement. Technique and results]. Orthopade 2009; 38(5): 412-8. Sankar WN, Nevitt M, Parvizi J, Felson DT, Agricola R, Leunig M. Femoroacetabular impingement: defining the condition and its role in the pathophysiology of osteoarthritis. J Am Acad Orthop Surg 2013; 21(Suppl. 1): S7-S15. Sierra RJ, Trousdale RT. Labral reconstruction using the ligamentum teres capitis: report of a new technique. Clin Orthop Relat Res 2009; 467(3): 753-9. Lee S, Wuerz TH, Shewman E, et al. Labral reconstruction with iliotibial band autografts and semitendinosus allografts improves hip joint contact area and contact pressure: an in vitro analysis. Am J Sports Med 2015; 43(1): 98-104. McConkey MO, Moreira B, Mei-Dan O. Arthroscopic Hip Labral Reconstruction and Augmentation Using Knotless Anchors. Arthrosc Tech 2015; 4(6): e701-5. Costa Rocha P, Klingenstein G, Ganz R, Kelly BT, Leunig M. Circumferential reconstruction of severe acetabular labral damage using hamstring allograft: surgical technique and case series. Hip Int 2013; 23(Suppl. 9): S42-53. Ferro FP, Philippon MJ, Rasmussen MT, Smith SD, LaPrade RF, Wijdicks CA. Tensile properties of the human acetabular labrum and hip labral reconstruction grafts. Am J Sports Med 2015; 43(5): 1222-7. Baer GS, Harner CD. Clinical outcomes of allograft versus autograft in anterior cruciate ligament reconstruction. Clin Sports Med 2007; 26(4): 661-81.